what is your overall opinion of the Trust Technique Clinic? I feel so incredibly privileged to have been part of your course this weekend, thank you. I'm so glad I was quick at putting my name down!! I haven't stopped talking about it since I got home!! Being Present with Bobbi on Sunday was an incredibly moving experience and is something I'll never forget. The world would be very different place if we all used the Trust Technique. What a truly wonderful 2 days. To have been able to find peace tranquillity and a true regard for both people and animals has been such a very moving experience which I look forward to moving on with. Just completed the Trust Technique weekend at Mane Chance Sanctuary - it was phenominal. As a pet owner, my relationship with Tayto (rescued Jack Russell) has blossomed. James helped me through my own blockage which greatly helped me relate to Tayto's issues. Working with the horses opened up a whole new understanding for me - a whole new dimension to the world that I had missed. I encourage everyone to come meet James & Shelley and experience what they have created and witness the wonderful potential that lies ahead. 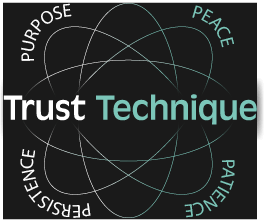 Gentle, subtle and yet so powerful is how I would describe the Trust Technique. I found the whole weekend very inspiring, James is a great teacher. I feel I have been shown a new way of being with animals. I have already been putting into practice what I learnt with my animals at home and I know this will also enhance my work with animals as a healer and animal communicator. I received so many things from this weekend I feel that it has touched me on a deep level. I found the time spent with the horses to be very special and moving. I would highly recommend this clinic. As someone who treats animals as well as humans in my profession as an osteopath, this course answered a lot of questions that had arisen for me over the years - in some ways, it felt like coming home to something I'd glimpsed before from a long way off but James made it clear and simple and profound, all at the same time and the physical effect on the horses was clear. Working with James, Shelley and the horses at Mane Chance was a wonderful weekend and a privilege; I know that the tools it has given me will help me with my current work and my own 'stuff' and I am excited about the doors to new possibilities that it has opened. I recommend this course to anyone who works with or owns animals. Wow, that was a weekend to remember for the rest of my life. I loved every minute and learned so much from this course, I could hardly bring myself to leave at the end of it. It's such a simple and logical concept although so difficult to explain, but James and Shelley managed to show us everything with their peacefulness, regard, patience and understanding. Thanks so much - you and the beautiful horses have been an inspiration to me and opened up a part of my soul that I didn't know existed. I now hope to follow my dream. I took part in the Trust Technique weekend on 6 and 7 September this year. and in many ways it felt like coming home. I have studied the work of and have met several animal communicators, healers and 'whisperers' over the past 20 years, but James French beats them all. Not only is the trust technique incredibly powerful, works on humans as well animals, but it is also beautifully simple. You do not need special equipment, round pens or 'magical' gifts. All you need to do is to be present. This can be learned by anybody and it can be applied anywhere, at any time. As a volunteer at Mane Chance Horse Sanctuary, I have seen first hand how extremely traumatised horses can be turned round into happy, relaxed and trusting animals using the trust technique. I myself have started using the trust technique with my own animals at home, but I have also started applying it at work, in my class of 13 junior school children with special educational needs. When we all get present, a wonderful sense of calm and peace settles over the room. My assistants and I also use the technique to support children who are feeling anxious, overwhelmed, or who have just had a tantrum or other major upset. Especially those children who have limited speech or are emotionally fragile, are able to release a lot of tension with the trust technique and will often sigh and yawn before they settle back down to work again. Wouldn't it be great if every teacher in the land could learn the trust technique? I am so pleased I attended this course. It was just what I needed I was feeling a bit stuck and looking for something that I could do to help myself and others. It is amazingly simple but really powerful. Meeting like minded people on the course was also wonderful. I am hopefully going to continue studying with James, he is very talented and compassionate. If you are looking for a healing technique that you can see working then this is it!! If you are reading this then just book the course, you will not regret it! What an amazing weekend on the Trust Technique course with James, Shelley, Evie and the beautiful horses. James is such a warm, peaceful person, and a very gentle teacher. Lots of happiness and humour while learning to regard animals and help them with the Trust Technique. I`ve come away feeling very peaceful and I hope I helped to give some of that peacefulness to the horses I sat with. They are a really special group of horses, so gentle and affectionate and sometimes cheeky (Blueboy!) They are so full of character and how I wish I could be around them everyday. James and Shelley have the most amazing life helping those animals. I couldn't think of a better thing to do in life. If I can do another course at Mane Chance with them I will do. I have been around horses for many years in a very informal way. I loved the approach taken by James, and the Trust Technique results are beyond amazing. After a truly heartwarming weekend, i have today spent time with my own horses, starting to put into practice what I have learned this weekend. That was a wonderful experience, and one I look forward to repeating tomorrow. My little herd of three and I will benefit SO much from what I have learned. I fully recommend this technique for anyone who wants to connect with animals on a very deep, compassionate and fulfilling level; and really feel that given the opportunity, your animal companions would ask you to attend! ! This was an amazing, life changing, weekend. James and Shelly have shown me a completely different approach to 'working' with horses and I feel a new door has opened for me in how address Issues in the future. Thank you so, so much. I am exhausted but reflective and it's all positive. My confidence about being with horses is restored and am keen to share with others. Try it, there is nothing too and so so much to gain. It was by pure divine intervention that I found and was able to attend the Clinic on 31st of May 2014. It is truly one of the most profound experiences that I have ever had. I was reminded of my true self again. It reaffirmed my beliefs that we are not here to dominate animals but to walk side by side with them, in harmony and with love and respect. We should not dominate and overpower them with our demands, to then be upset and angry when they do not respond in the way we wanted them to. The weekend with the horses was so peaceful and harmonious. Learning about the trust techniques and the effects it has and then seeing this in practice on humans and animals alike is very humbling. I have since started to apply this to all aspects of my life and the ripple effect on relationships, business, my pets and all animals round me has been truly amazing to see. In all this, I have found a calm, peaceful place that has made my life so much better. I would just like to say big thank you to James, Shelly and all the horses at Mane Chance; what you do matter so much to humans and animals! I attended the Trust Technique Clinic at Mane Chance Sanctuary on the 31st May and 1st June, travelling from Ireland. It was an amazing experience and life changing for both humans and animals. I can only highly recommend attending one of the clinics (even if you live abroad, it is worth travelling for it). Mane Chance Sanctuary is a beautiful and soothing place, a little piece of Heaven on Earth. James and Shelley are inspirational, very warm and kind. Their passion for the Trust Technique and the welfare of the horses and all animals shines through. I came out of the week-end feeling very peaceful and have managed to keep the present moment feeling with me ever since and my dogs love it. A big Thank You again to James and Shelley for the unforgettable experience. I took part in tht TT weekend recently (30th- 31st of May 2014) it was the most amazing experience I've ever had and it's incredibly difficult to find the right words to sum up the experience. It was great to get in touch with animals in such a tranquil place and I loved that the trust technique is about slowing down and getting present so as the animal feels comfortable in human company. I am a recent vet nursing grad and will definitely be using this technique to help reduce stress for the animals which will further help their recovery. The weekend also worked on using the technique for ourselves also and it was quite an amazing experience and impowering to be able to quieten any negative thoughts that I had. I will continue to use this for myself and animals as it so worthwhile for us all! A huge thank you to James and Shelly for sharing their knowledge and passion in such a gentle, warm and caring way. I'm so happy there are people out there trying to bring balance back to the human animal bond. A huge thanks to all the horses of course too : ) especially Fred, Snoop and Timmy. I miss everyone already! I highly recommend this experience , it will be one to remember! We attended a trust technique seminar with James and the difference in handling our animals has been immense. I use the technique nearly every day when I bring in my horses and to calm them down when they are feisty. We have already enrolled for the ACT1 course and I can’t wait to start. I have been a supporter of Mane Chance Horse Sanctuary since the start and have been observing James French’s work for some time. Being a lover of Animals I thought I would enrol for the Trust Technique Clinic which was held at The Mane Chance Horse Sanctuary. I cannot recommend it highly enough. James and Shelly are passionate about the Trust Technique and that passion was picked up by the group. 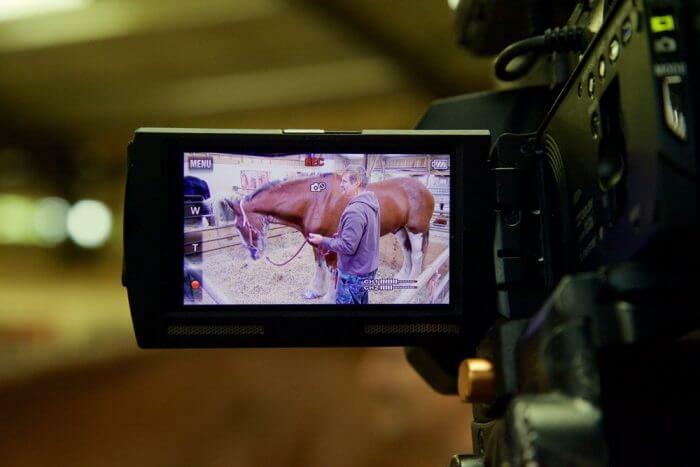 James teaches you how to get present with the horses which is an unbelievable experience. James and Shelly also taught us life skills that can be used to keep us calm and relaxed in the busy and stressful world we live in. I drove back to the North West a happy and relaxed camper. Had a most amazing and life changing weekend learning about the Trust Technique with James French and Team. Being amongst the horses was a humbling experience never to be forgotten and both my Greyhounds experienced the magic of the weekend too. James kindly taught Paddy that men were OK really and Desi grew up.....Thank you All. I attended a Trust Technique clinic because Ive been watching the videos and I thought it would be very helpful to get some practice with the experts. It was a wonderful weekend and I feel that I learnt so much, which I will use in my work with animals. The whole experience was gentle but profound and James and Shelley do amazing work. Shortly after the weekend I attended a conference on Awakening to Animals and I couldnt stop telling everybody about the Trust Technique. If you want to develop a deeper relationship with the animals in your life I thoroughly recommend attending one of these clinics! I just spent the most amazing weekend with James, Shelley and 7 other people at the Mane Chance Sanctuary learning the Trust Technique. It was a humbling and hugely cathartic experience and one not to be missed. If you have any interest in changing the life of animals (and yourself) for the better then there can be no better way than experiencing the bliss that you feel attending this wonderful course. This clinic helped me enormously. James explained the Trust Technique so clearly and concisely that I felt truly empowered to develop and deepen my relationship with my horses and dogs. The group learned together in a secure and safe situation; everyone moved forwards and supported each other. Its hard to believe that the way to a better understanding with our companion animals is so easy and available to us all. I would recommend - no, actually, I urge - anyone who has a problem with their pets or who wants to have a better understanding and deeper trust with them, to become a subscriber to the website membership and to attend a Trust Technique Course. Im sure it will change their lives. Had a truly mind blowing time at Janes on 14th/15th May. So many lovely horses and of course the dogs to work on. A really positive, mind calming experience. I went home a different person. James and Shelley, always encouraging and supportive. My sick dog is already feeling the benenfit of my calmer mind. Loaded horse using the technique too! Thank you James, Shelley and Jane for a great weekend! A really lovely workshop! I would reccommend the Trust Technique for anyone as it can help us all slow down and find the peace of mind and stillness so we can see the wood from the trees. The Trust Technique can help all of our relationships with people and animals. One word... Amazing!! I love the peace that the trust technique brings for animals and humans alike. I wouldnt hesitate to recommend this clinic to anyone who spends time with animals, be it for work or as members of the family. We spent the weekend working with some beautiful horses, dogs and goats. This morning I spent only 20 minutes with my stressy horse, when I left him... he was fast asleep! What a fantastic feeling! I have a lot to do with my horses but at last I can see a light at the end of the tunnel! I have just been on the Trust Technique weekend and want to say how much of an eye opener and wonderful weekend it was. James enthusiasm for what he does shines through and his teaching is very understanding, caring and informative. I find the technique useful for myself as well as for animals. I look forward to joining James on the Act 2 course also, which I am sure will prove to be equally inspirational and to have the same wow factor as the Trust Technique weekend had. Wow, when James and Shelly arrived at our centre, I was unsure what to expect. However before the training began James created a bond in a very short space of time with our new aquisition Monty a dalmation dog that had experenced a less than favourable start in life. Throughtout the training James showed with Monty how desire to bring peace and his special trust technique can bring positive change. When it came to our turn the delight on our faces was a sure giveaway to James and Shelly how excited we all were when we too could bring peace and benifit to our animals. The course was great guys thank you, I didnt want it to end. A month on the progression of Monty is producing more peace. I attended the April 10/11th 2010 trust technique workshop, and thoroughly enjoyed it.James and Shelly run a welll organised fun and relaxed workshop with a good balance between practical and theory sessions. Jamess infectious enthusiam for his subject is supported by his wealth of knowledge and experience, which he then deliveres in a clear, gentle and encouraging manner. As for the centre it was very calm and peaceful to be, thank you Emma.Many thanks James and Shelley. These two days were wonderful. They really opened my eyes to a new way of working with horses and myself. Great for personal development as well as horsey development. Excellent value for money. Yet another fantastic course ran by James and Shelley. Keep up the really great and important work!!! This is the way forward in understanding how to connect with our animals. It is helpful for pet owners or anyone working with animals on a professional basis. James is a gifted teacher who has has a way of making everthing very clear and easy to follow. Although I attended a dog course and I only have horses, I still found it very easy to translate to handling horses. I enjoyed the course so much Im going back for second helpings. I loved the Trust Technique weekend, thoroughly enjoying every minute from start to finish. The venue was perfect with a warm and welcoming energy and gorgeous animals. It was really useful starting with a demonstration before moving on to the theory and human work on the first day. James teaching flowed beautifully and the technique was explored in a very healing and sharing manner within the small group. The second day working on a practical level with the horses was just amazing, being able to immediately put into practice the technique we had learnt, with James constant support. Thoroughly recommended!